In today’s world it is not only actors who face the dilemma of “me”, but private individuals are also continuously reconsidering who they are and how they appear. This is the result of different types of social media platforms where we spend time on daily basis. The internet resembles a theatre where we are all acting and observing each other. In 35 x me and some actresses the theatre space is filled with interactive stations designed to instruct the audience on how to develop and project their internet personas online. We want to turn the internet into feminist utopia, a girls’ room where solidarity can happen. This is an artistic endeavour to create an alternative to the sexist culture that has come to surface in the wake of campaigns such as #metoo. Blaue Frau (FI) is a feminist and norm critical duo consisting of artists Sonja Ahlfors and Joanna Wingren. The group was founded in 2005 as a branch of the nordic drag king group Subfrau. 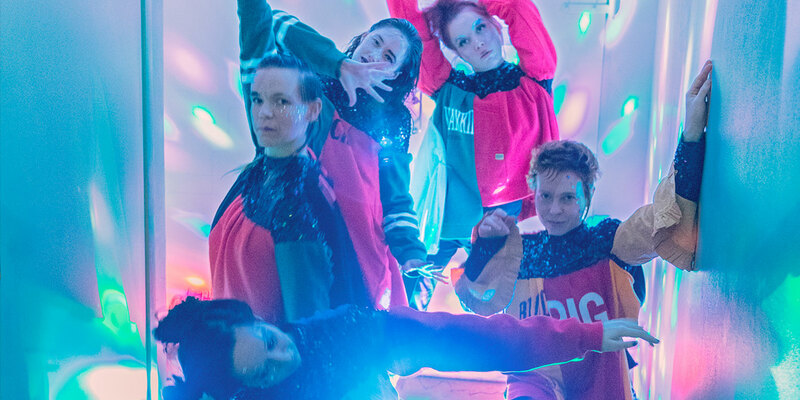 They create performances, workshops and podcasts and have been touring all over the Nordic countries. The last time they visited Malmö was in 2012 with a performance at Sommarscen.